The United States of America are home to an extraordinary number of beaches. Beaches of every variety can be found all around the United States, from small, secluded rocky spots with awe-inspiring views and calm waters to sunny stretches of sand that seem to never end. Whether you’re looking to surf, sunbathe, snorkel, or engage in some adventurous water sports to get your heart racing like never before, you can find all you need around America. And sometimes, beautiful beaches can be found in places where you might never have expected to see them. Located in the Hampton Roads metropolitan area out on the Virginian Peninsula, Williamsburg is a small historical city that played a major part in the American Revolution. Williamsburg, founded in 1632, is home to barely 15,000 people but attracts millions of visitors each year as part of the 'Historic Triangle' area that also includes Jamestown and Yorktown. The Colonial Williamsburg part of the city is one of its major attractions, but Williamsburg is also well-situated for some old-fashioned fun in the sun, being conveniently located near some of Virginia's best beaches. So if you want to spend some time on the sand in VA, Williamsburg is a great place to start. With the stunning Chesapeake Bay area and the majesty of the Atlantic Ocean right next door, Williamsburg, VA is a perfect place for those hoping to spend some time on the sand when the sun is shining. There’s actually a surprising amount of choice when it comes to beaches in Williamsburg, and it can be quite a challenge to decide which beach to visit on any given day. To simplify the choice, check out the useful information in our Williamsburg beach guide below. Situated on the banks of the James River and backed by a beautiful pine tree forest, Jamestown Beach Park is one of the very best beaches in the Williamsburg area. The park underwent renovation not too long ago and has enjoyed a new lease of life since then, attracting many visitors from local areas and afar. People of all ages can have a lot of fun here, but this Williamsburg beach definitely has a lot of appeal to families and groups of friends. The beach is fitted out with lots of BBQ grills and picnic areas, so it's a super spot to come with some good food and good company to celebrate a special occasion or simply enjoy some tasty treats on a sunny day. Just off Colonial Parkway in James City County, College Creek beach is one of the most popular in the Williamsburg area and is very easy to access. It offers very soft golden sands, as well as grassy areas for ball games and picnics. The waters are wonderful to observe and admire here, but this isn't a good swimming beach as the current is very fast and dangerous, as well as having a major drop off if you walk out too far. So, if you do visit College Creek, be sure to stay close to the sand and simply dip your toes in the water rather than going for a swim. Families can have a lot of fun here, but it's important to keep an eye on children at all times as there are no lifeguards on duty. If you're in the Williamsburg area and want a truly incredible beach experience, it's worth making the short trip down to Virginia Beach. The North End beaches here will take your breath away, filled with stunning soft sands and amazing blue waters. Lots of families and kids can be seen running around and enjoying this beach, but a key aspect of the North End part of Virginia Beach is that you won't find any amenities here. There aren't any restrooms, showers, or lifeguards, so you'll have to bring your own food and keep an eye on the kids to make sure everyone stays safe. 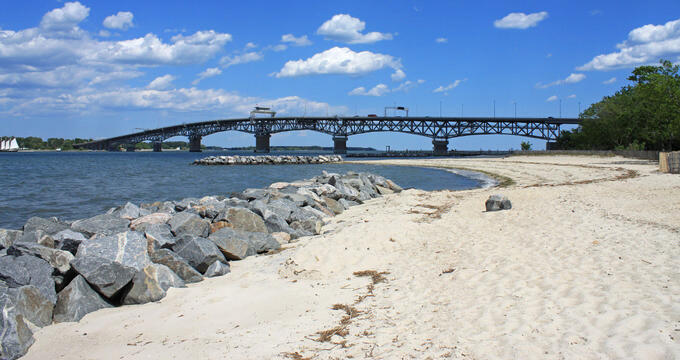 Very close by to Williamsburg, Yorktown Beach is located just by the George P. Coleman bridge. It's also very closely situated to the beautiful old buildings and historical sites of Yorktown itself, so it can be a lot of fun to spend some time walking around the town and admiring the local heritage before heading down to the beach for some relaxation and fun in the sun. This is a beloved beach but never a busy one, and there plenty of fun activities to be enjoyed here including surfing, boating, swimming, and more. You'll also be able to check out the nearby Riverwalk area, lined with stores, restaurants, bars, and more. One of the most untouched and pristine parts of the Virginia coastline, First Landing State Park is situated at the northeastern end of Virginia Beach. This is one of the few beaches in the Williamsburg area that allows dogs on leashes to enjoy the sand, so if you like to bring your furry friends along for fun in the sun, First Landing State Park is a good spot to choose. It's a short drive away from Williamsburg but the drive is scenic and the beaches are more than worth the trip. The park is also filled with hiking and cycling trails, camping areas, picnic spots, and more. Among the trees or out on the sands at First Landing State Park, you'll feel a million miles away from the city, and this is a nice spot to do some wildlife spotting as well.